Ten Tales from Tibet offers ten gentle, yet powerful, lessons exploring compassion, the very essence of Buddhism. 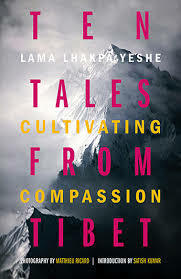 A collection of poetic re-tellings distilled from ancient oral tradition, the stories have been specially chosen by Lama Lhakpa Yeshe because they demonstrate a beautiful wisdom in a simple, yet profound way, and teach us how to nurture the singular human quality that defines us all. Introduced by global peace and environment campaigner, Satish Kumar, a pupil of Lama Lhakpa Yeshe, and illustrated with photography by fellow Buddhist Matthieu Ricard, this is a beautifully crafted book and unique guide to opening our hearts and minds by cultivating compassion--helping others and ourselves--to find joy, peace, and happiness.